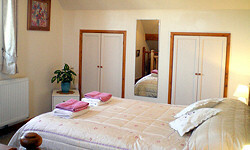 "...A very restful and enjoyable stay. We loved the panoramic views and very well-equipped cottage..."
We aim to provide peace and privacy in this beautiful setting. 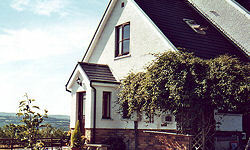 The cottage has an open-plan design. 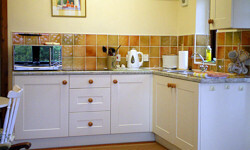 Downstairs is a kitchen/diner with round dining table and chairs and is fully equipped with modern facilities including an electric ceramic hob, electric kettle, toaster, crockery, cutlery, microwave/combination oven and fridge/freezer. 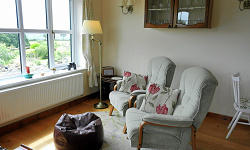 The comfortable living area has a TV/DVD, radio and two easy chairs with panoramic views over the Towy Valley. An extensive range of maps and guides and reading matter are available for use throughout your stay. A wi-fi connection is available in the cottage. A delicious wholefood continental breakfast can be provided next door in Bryndolau at an additional charge of �95 per person. Click here to view the Breakfast Menu. Stairs lead to a barn-style bedroom with double bed and modern en-suite shower room with w.c. and hand basin. There are views from the window along the Brecon Beacons towards Llandovery. Outside there is ample parking and a private seating area with open access to garden and fields. - Flexible mid-week bookings available. - From � per night � minimum 2 nights� stay. 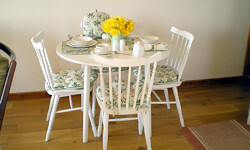 - All linen and heating included. - Optional delicious wholefood continental breakfast @ �95 per person. - Open access to garden and fields.